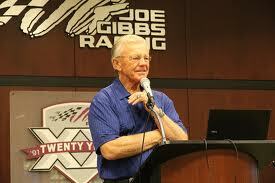 Former Washington Redskins coach Joe Gibbs has been announced as a guest speaker at the Columbus Trade Center in Columbus, Georgia on September 10th. The talk is being hosted by the Calvary Baptist Church, who are even paying to transport soldiers from Fort Benning to the CTC to have the opportunity to hear Gibbs speak. He is thought to discuss matters about diversity and overcoming hardships both as individuals and groups, in light of this talk happening just one day before 9-11. In addition to that, it is fairly likely that Gibbs will bring up his book that was published in 2009 titled “Game Plan for Life”, which has the overall theme of planning one’s goals for future success. The North Carolina native went to college at San Diego State University to play football as a quarterback for the school, and ended up earning both his Bachelor’s and Master’s degrees by 1966. During his last two years at SDSU, Gibbs became the offensive line coach for the team which is how he made his entry into the coaching world. Between 1967 and 1980 he performed a variety of different coaching positions for teams such as Florida State University, University of Southern California, University of Arkansas, St. Louis Cardinals, Tampa Bay Buccaneers, and the San Diego Chargers. The three-time Super Bowl Champion then took the job as head coach for the Washington Redskins for the next 26 years before retiring to an admin position for the team that he still does today. The two-time AP Coach of the Year will be traveling to Georgia next month to give a talk at the Columbus Trade Center on September 10. Military soldiers posted nearby will be able to attend at the cost of the Calvary Baptist Church, who are hosting the event.